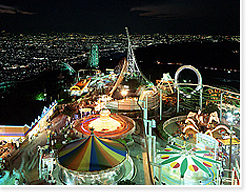 Ikoma Sanjo Amusement Park is perched atop Mt. Ikoma at an elevation of 642m, and was opened in1929. From the amusement park, are spectacular unbroken views of Nara basin and Osaka plains, along with panoramic visibility of locations as far as Awaji Island and Akashikaikyo Bridge. On opening construction in 1929, a 30m tall flight tower was also constructed, which today is the oldest and most famous flight tower in Japan. In addition, amusement park facilities also include "a dogs and cats petting forest Ikoma" housing 80 rare, curious, pedigree and cute dogs and cats from around the world, all of whom are awaiting your attention. During the hot Japanese summer, we open at night for a range of events in a cool temperature, some 4-5 degrees cooler than the city. Many people join us, why don’t you?